Subtle peat on the nose, mixed with smoke, burnt caramel, leather and tobacco notes. Oily with herbs, lovage and oregano. A fruity touch of blood orange with tender pepper in the back. Surprisingly, although the alcohol content is quite high and the whisky's very young, it isn't pungent at all. At first, bold, intense and pleasantly sweet on the palate. However, a powerful spiciness and warmth immediately spreads in the mouth so that one can hardly breath. Then creamy notes of fruit, oranges and plums emerge, followed by tobacco leaves and tender peat smoke. Extremely mouth-coating. The finish is medium-long and warm accompanied by a slightly bitter fruitiness of oranges and grapefruit. A bitter touch of grape seeds and subtle nutty flavours linger on the tail. A splash of water tames the peat smoke, the fruitiness and reduces also the herbal notes on the nose. Few more bitter flavours emerge. Still bold and intense on the palate with a delicate fruitiness of oranges, plums and a touch of mint in the back. Warming with a slightly decreased spiciness of oak, pepper and cinnamon. The finish is medium-long, warm and creamy with bitter notes of oranges, grapefruit and hints of leather. 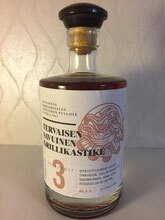 This single malt whisky from Finland is very powerful and almost uncompromising. Intense spiciness and warmth, combined with a creamy fruitiness and nicely wrapped in fine peat smoke. For its very young age, the alcohol is already good integrated. A few more years of ageing, however, would have been better for this dram, at least in my opinion.